We know that marketers try and use different A/B testing tools with the intent of discovering the one that works the best. This repeated trial and error method wastes valuable time and energy because the process of finding the perfect A/B Testing tool almost never ends. To help all such marketers, G2 Crowd has come up with an exhaustive report comparing some of the top performing A/B Testing tools out there. 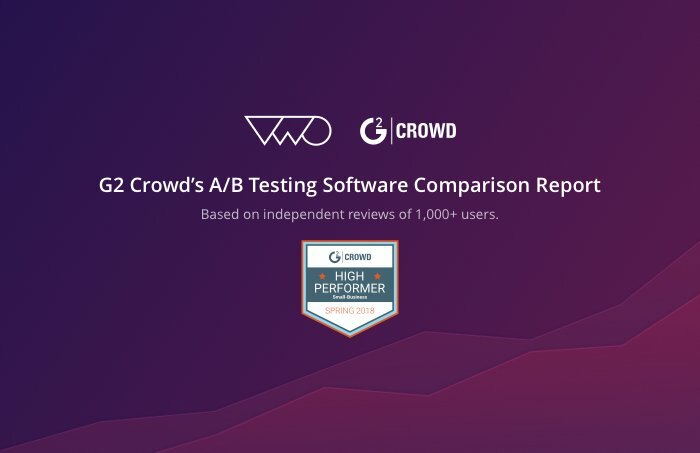 AND we are excited to tell you that VWO is ranked one of the top performers in the G2 Crowd A/B Testing Report. VWO has been the tool of choice for more than 5,000 businesses across the globe to seamlessly plan, manage, and execute their conversion optimization programs. This report is generated based on 1,000+ independent user reviews from thousands of independent users of leading A/B testing tools. The comparison is based on product features, quality of support, user satisfaction ratings, and other parameters. All the platforms are ranked solely on the basis of user satisfaction ratings (based on the number of reviews, market share, vendor size, and social impact). The time for asking around for recommendations is over. No more need to try one A/B test tool and compare it with another. The G2 Crowd report has done it all for you, and the results are out! After you have read this report, you will be in a position to make an informed choice that will enable you to progress in your conversion rate optimization journey. Now you can leave the trial-and-error search for the world’s Best A/B testing platforms and deploy the best that suits you based on your objective, verified findings.